You could say that Tetsuya Wakuda has come full circle in life. 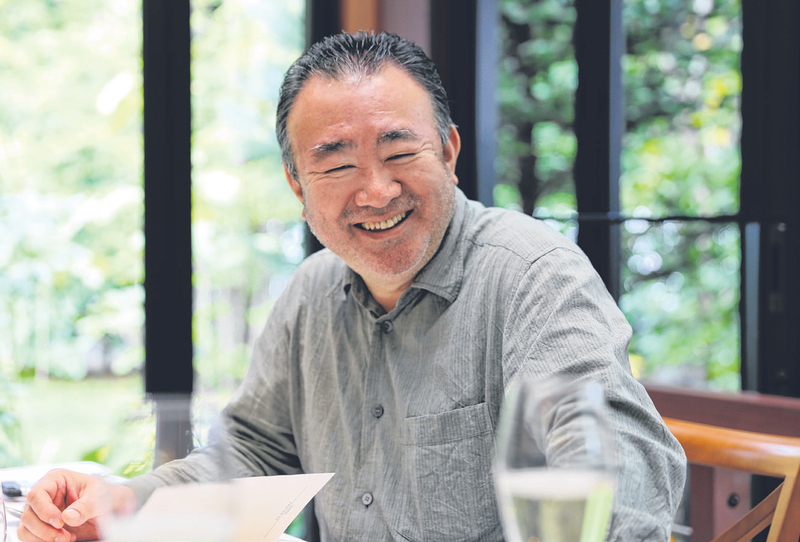 Born in the town of Hamamatsu in Shizuoka, he left Japan in 1982 at the age of 22 with little money or knowledge of English; much less any plans to become a world-acclaimed chef with his Sydney restaurant Tetsuya's and Waku Ghin in Singapore. Now, one of Japan's favourite prodigal sons is back - famous, self-made, fluent (kind of) in English - as the de-facto ambassador of Shizuoka, with the mission of spreading the good food news about this lesser-known Japanese prefecture. But it's not just Shizuoka per se. Since he opened Waku Ghin at the Marina Bay Sands some six years ago, Chef Wakuda has played culinary mascot - bridging the gap between Singapore diners and the top echelon of Japanese produce that no one else in town has access to. That so much of it comes from Shizuoka isn't out of sentimental obligation to his hometown; with its proximity to mountains, lakes, deep sea and arable soil, Shizuoka is a living, breathing Garden of Eden with its own gourmet shop. And when Chef Wakuda offers to take you on a personal guided tour of all his favourite food stops, it's not an invitation anyone refuses. 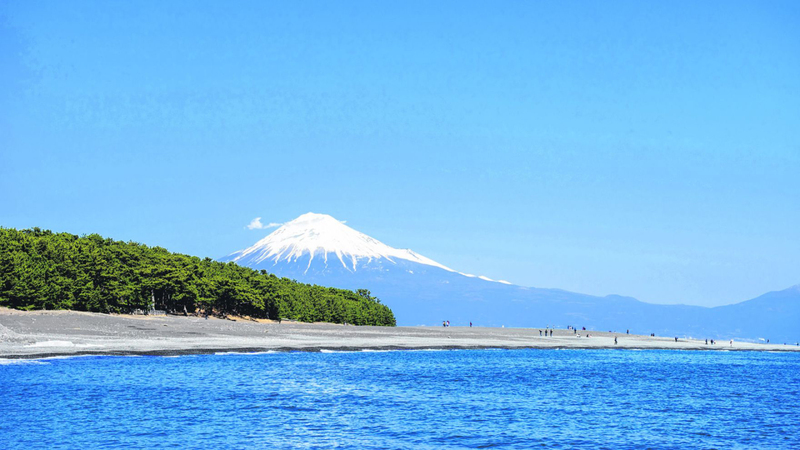 Even if you're a frequent shopper at the Gotemba factory outlet village - where good weather gets you a clear view of Mt Fuji - or a sybarite who makes an annual pilgrimage to the onsens of Hakone, there is more to Shizuoka than you can possibly cover in one visit. 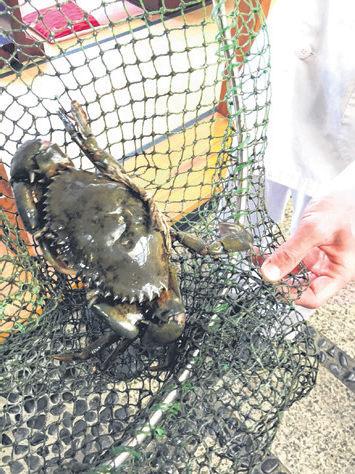 It stretches along the Pacific coast on Japan's main island of Honshu and encompasses Mt Fuji, Izu Peninsula and Suruga Bay, from where all the good onsen water and seafood come. On land, you can gorge on local beef and its famous Crown melons, mikan (tangerines), wasabi, green tea and anything that can be grown in the ground - which is a lot. Miho no Matsubara is our first stop after arriving at Shizuoka station, about one and a half hour's train ride from Tokyo. This is where you get your awe-inspiring view of the day as the morning light reflects off the fine, black powdered sand free of man-made debris. Here, the only litterbugs are clams who walk away and leave their shells behind. 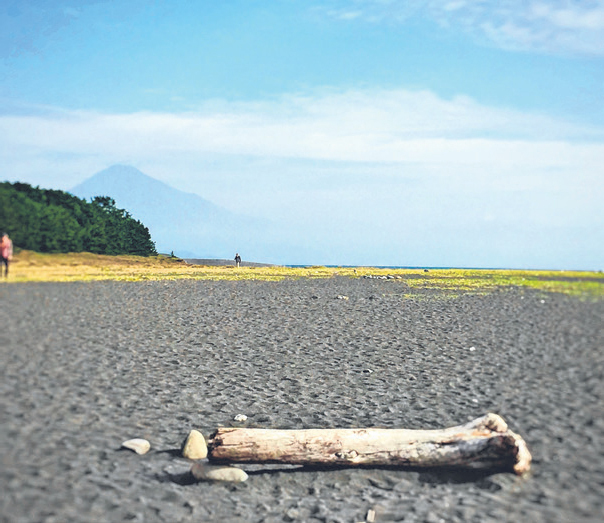 This beach captures the beauty of Mt Fuji in the distance, Izu Peninsula and Suruga Bay - with the deepest waters in Japan. A forest of pine trees completes this Zen moment. Suehirozushi shares the same name as many other sushi joints in the city, so make sure you go to the right one. You'll know from the sight of the giant slabs of tuna sitting in chef Eiji Mochizuki's glass display that you've hit the jackpot. 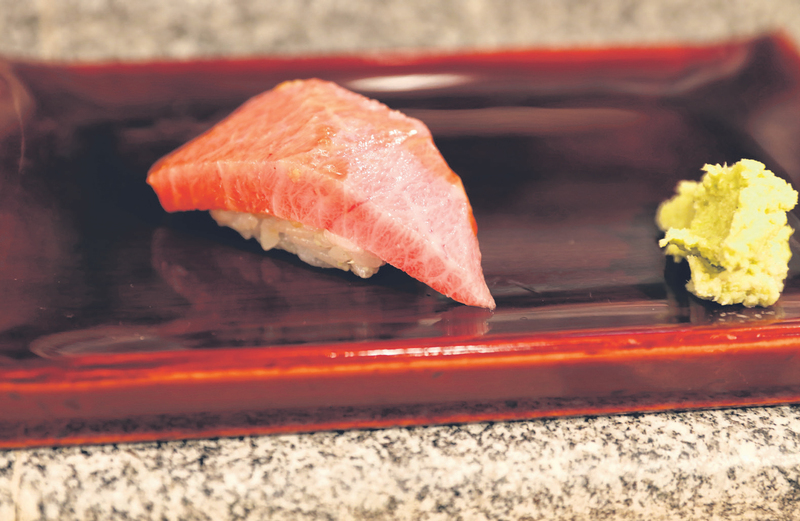 "Ninety per cent of the tuna caught in the Indian Ocean goes through Shizuoka," explains Chef Wakuda, which is why this shop is able to get the cream of the crop. Watch the chef peel off layer after layer of flesh, leaving behind translucent layers of fat and sinew that he grills into bacon-like sheets. This is where we get our first taste of hagashi toro - cottony-soft, buttery flesh that's apparently cut close to the tail of the fish. There's a lot to remember from this place - live squirming abalone, large shrimp and clams - but the sensation of that cloud of tuna slides straight into our long-term memory bank. Sasue Maeda is virtually the heart and soul of Waku Ghin. Chef Wakuda buys most of his seafood from Naoki Maeda, scion of this family-run shop that has been in business for some 60 years. The boyish, always-smiling Maeda-san is happy to show you the huge flounder still alive and ambling in its cosy water bath, soon to embark on its flight to Singapore. 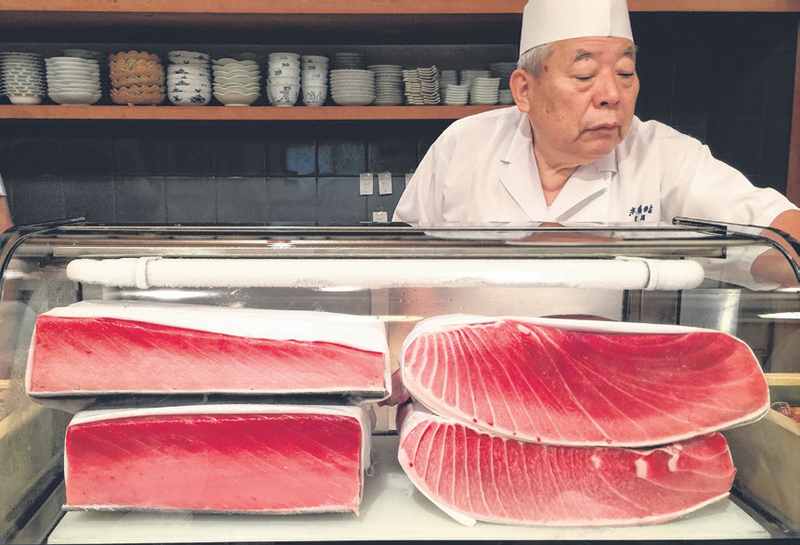 His large shop features tanks of live seafood and a team of fishmongers constantly gutting, scaling and cutting to fill the shelves with ready-to-eat sashimi for local customers. It's a great place to buy frozen Sakura ebi, ikura, shirasu (whitebait) and even chilled sashimi to bring home to your own dinner table. Address: 4-15-7 Nishikogawa Yaizu city, Shizuoka 425-0036. Tel: 54-626-0003. Tempura Naruse is like the Holy Grail of tempura in Shizuoka. It's near impossible to get a reservation unless you're Chef Wakuda. But if you're able to work reservation magic, be prepared for an onslaught of tempura like you've never had before, simply because of the unbeatable ingredients you can't get elsewhere. Chef Takeo Shimura works with two pans of oil, one at a lower temperature for longer cooking and extra crunch. From gingko nuts and burdock to an array of seafood including a melt-in-the-mouth tachiuo fish (all supplied by Maeda-san, no less), it's an experience you need to try at least once. Address: 2-5-12, 1F, Takajyo, Aoki-ku, Shizuoka-shi. Tel: 054-273-0703. Miyahara Wasabi Farm is located in Utougi district, the birthplace of wasabi. Chef Wakuda is a regular customer, buying up the giant specimens that owner Toshiho Miyahara's family has been growing for 60 years. The farm is like a field of green gold (when you think about how expensive fresh wasabi is in Singapore) so make sure you get a good whiff of it. If you want a taste, check out the wasabi farm shop Utsurogi, for the chewy soba and wasabi, or fiery salad made of chopped wasabi stems. Address: Utsurogi, 421-2303 280-1, Utougi, Aoi-ku. Ogawa Oden is the oldest oden shop in Shizuoka City and is housed in dingy premises where an elderly lady presides over a bubbling steel vat of brown broth that looks like it's been simmering for a few decades. Nothing fancy, just take your pick of daikon, assorted fish cakes and konnyaku and enjoy it with a dab of mustard. Address: 420-0867 38, Baba-cho, Aoki-ku. Maruhan Hesomagari has the best eel rice you'll ever have. Yet another native of Shizuoka, the unagi has none of that muddy aftertaste - just fresh, meaty eel coated in a non-cloying tare (sauce) that you wolf down with rice. Eat. Repeat. Address: 1-12-9 Tachibana, Fujieda, Shizuoka. Isojiman Sake Brewery is one of the cleanest breweries you'll find, thanks to company president Teraoka Tomoyuki, who designed the facility to make sure that the quality of its premium sake stays consistent. Using the concept of 'terroir' as in fine wines, Isojiman uses Yamada Nishiki sake rice grown in Hyogo prefecture. The premium sakes are hard to find, but if you're a connoisseur, this is a name you need to know. Address: 307 Iwashigashima-Yaizu, Shizuoka. Tel: 54-628-2204. Chagama is a cool but totally serious tea cafe run by tea master Marumo Mori. Shizuoka is the home of Japan's best green tea and this is where you can learn and taste the various varieties. Check out its intense tea 'espresso' which gives you the same kick and keeps you alert for hours. Another brand of tea to check out is from Kawanematcha Co, named after Shizuoka's prime tea-growing region. The new company owns one of only a few certified organic tea farms in Shizuoka. Address: (Chagama) 1F Passage Takajo 2-10-7 Takajo, Aoki-ward, Shizuoka City. Tel: 054-260-4775. Clematis no Oka is a little urban oasis opened by a Japanese tycoon/philanthropist who wanted to house his personal art collection and give people a place to enjoy art and culture in a garden setting. The sprawling grounds house three museums - one dedicated to the art of Bernard Buffet. There's also a flower shop, cafe and a beautiful Italian restaurant Primavera with a treehouse-like setting. The elegant, fine dining restaurant serves lovely, light Japanese-Italian fare. A must-visit. Address: 347-1 Clematis no Oka, Higashino, Nagaizumi-cho, Shizuoka 411-0931. Tel: 055-989-8787. Izu Fishery Co-Operative Association Nishina Department Store sounds like quite a mouthful but it's really a hole-in-the-wall shop that sells fresh-caught seafood and general merchandise. Get live abalone sliced then and there, turban shell clam, live squid - served as sashimi or marinated on rice with a raw egg to mix it all up. 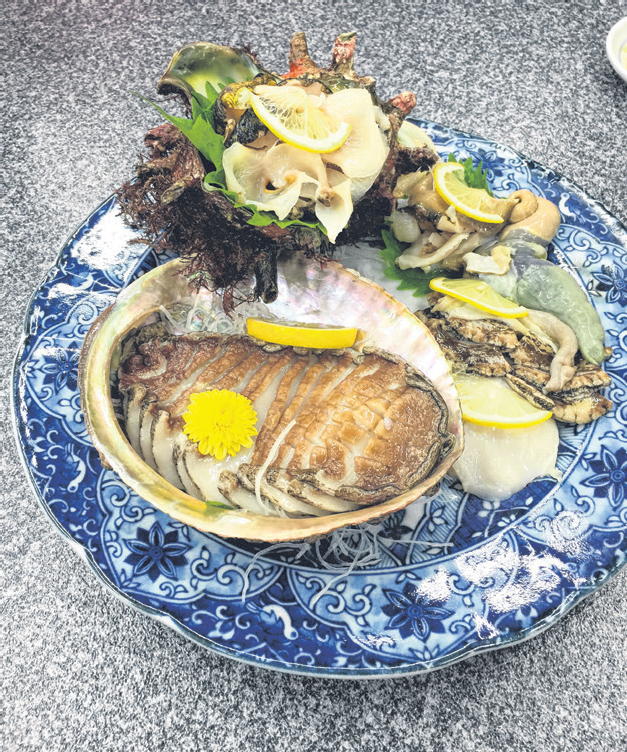 The clam sashimi can be hard and rubbery, but the abalone is tender and the squid is slippery sticky good. It might be hard to find but it's worth the effort for a taste of local life. Address: Nishina Nishiizu-cho, 910-6, 410-3514. Tel: 0558-52-0018. 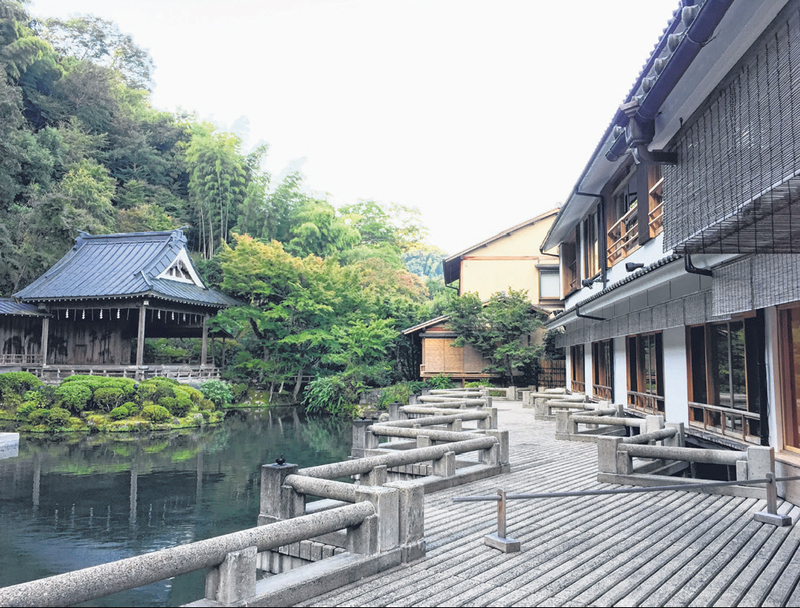 Asaba Ryokan is one of the fanciest places to rest your head in Izu. The Relais & Chateaux property is all about quiet elegance and omotenashi or Japanese hospitality. Traditional rooms overlook a calm lake for a tranquil ambience. There are private baths in each room or you can soak in one of their communal baths, followed by an elaborate kaiseki dinner. Address: 3450-1 Shuzenji, Izu-shi, Shizuoka 410-2416. Tel: 0558-72-7000. Mikkabi is a veritable Orange County of Japan, with its cute orange streetlamps and other fruity paraphernalia around the city. It's home to the mikan - sweet and juicy tangerines that flourish in the gravelly soil of the area. 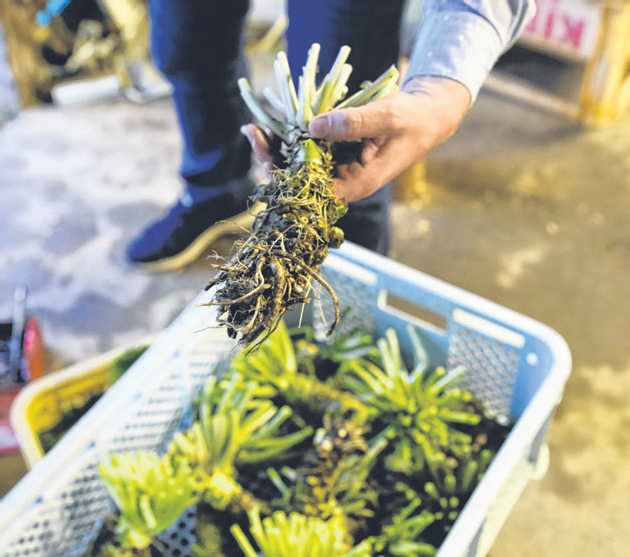 The soil and Shizuoka's good weather are perfect growing conditions for many fruits, including strawberries and prized melons that cost a fortune like the top-of-the-line Crown melons. Tasuke Restaurant lets you see your food swimming in a large pool before it's lifted out and prepared at its peak. What we don't quite expect is for our flounder sashimi to be presented in the shape of the original fish but with the head and tail still twitching somewhat. But the deep fried turtle stays still as we pick into the delicate flesh. Also very good is the puffer fish sashimi and grilled eel. Address: 3212-3 Maisakachobentenjima, Nishi-ku, Hamamatsu, Shizuoka. Tel: 53-592-1919. Ganyudou is a 150-year-old sweet shop that specialises in yokan - a kind of sweet red bean jelly that's traditionally served with green tea. It's a quaint little tea house with pretty hand made treats comprising different kinds of bean paste. It also makes dorayaki - red bean paste pancakes - on the spot so enjoy the lovely fragrance as you indulge in some sweet history at the same time. But having an extremely tight budget doesn't necessarily mean that you have to give this amazing destination a miss. and 19,990 yen or approximately $249 for a week's stay. Found in Tokyo and Osaka, Net Maru is a net cafe that can also double up as a basic but comfortable hotel. 10 minutes in the shower will cost you only 100 yen, which is approximately $1.20. Unlike the typical capsule hotels and net cafes, Net Maru features women's only floors and rooms. There are even powder rooms specially for ladies and a common laundry room with cash-operated washing machines. And if you worry about food, hot water dispensers and microwaves are provided for all in-house guests. While smoking is prohibited within the premises, there are designated smoking rooms in the common areas. But of course, which place is complete without wifi? Not only does Net Maru offer wifi, it offers free wifi and a net connected PC for those who need to catch up on their social media activity. Now, who says there is always a heavy price to pay for good quality? Katsuragi Kitanomaru is a charming, unpretentious ryokan that serves pretty impressive dinners including sea eel cooked in dashi, lobster salad and grilled tilefish with local abalone. A highlight is a bow-tied server carving tender beef cooked in a salt crust. Address: 2505-2 Ugari, Fukuroi 437-0121, Shizuoka. Tel: 538-48-6111. Gotemba Kogen Resort is a sprawling, kid-friendly resort at the bottom of Mt Fuji. At night, it's like a theme park with fairy lights and funfair activities. It's got an onsite microbrewery and the restaurant offers mainstream but very reasonably-priced food including very decent steaks for around S$20. Address: 719 Koyama Gotemba-shi, Shizuoka-ken 412-0033. Tel: 550-87-3700. The writer's tour of Shizuoka was hosted by the Shizuoka Prefectural Government.